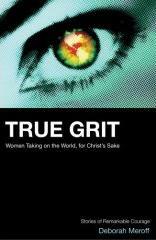 George Verwer's "book of the decade" is True Grit: Women Taking on the World, for Christ's Sake. This book is excellent. It is comprised of easy-to-read stories and "vital statistics" files. It tells of the atrocities that women and girls endure around the world: trafficking, prostitution, poverty, inequality; and things I hesitate to mention here. I confess that I need to wake up on many of these issues. I am not even close to grasping these realities, let alone acting on what I know. To obtain a FREE COPY of True Grit, go to GeorgeVerwer.com.